Mittelbergheim is one of Alsace's finest and most authentic villages. Here it is enough to just stroll along the beautiful streets with houses since the 1500s. But behind the facades several innovative producers are hiding. Many show great interest in so called natural wines. They are Rietch, Rieffel, the newly established and microscopic Catherine Riss and André Rohrer. André has Pinot Noir at a third of his land. From this he makes three cuvées of red wine and a crémant Blanc de Noir. Fun! 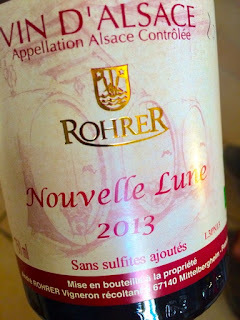 2013 Pinot Noir Nouvelle Lune by André Rohrer in Mittelbergheim has inviting and open aromas of black cherry, strawberry, vanilla and liquorice. The taste is full-bodied and very fruity, almost like grape juice, still the fresh acids are in place along with firm tannins that give fine structure. The aftertaste is long and remarkably clean. A natural wine. Price: € 13.20.